Said to be the third oldest building in Greenville, the Fountain Fox Beattie House was built in the early nineteenth century, some time prior to 1834. Textile merchant Fountain Fox Beattie built the home, which originally was smaller and simpler in design, for his bride, Emily Edgeworth Hamlin. 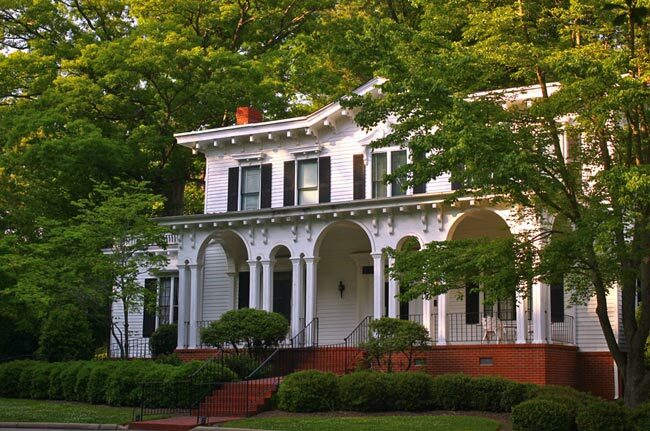 The Beatties’ son, Hamlin, was responsible for giving the home its present Italianate features in the late 1800s. The original grounds also underwent extensive landscaping over time, giving rise the the home’s nickname, the Arboretum. The house remained in the Beattie family for generations and was the site of many social and cultural gatherings in Greenville during the city’s nascence. The home originally sat at the intersection of East North and Church streets. In 1946 the City of Greenville purchased the property in order to widen Church Street. Subsequently, in a move aimed at preserving the house, the Greenville Woman’s Club was founded. The club assumed responsibility of the home, leasing it from the city for $1 a year. The group relocated the home to its current location in 1949 and used the building for meetings and gathering while renting it for weddings and other events. It was moved a second time in 1983 to make room for high rise office buildings and a parking garage. The Greenville Woman’s Club disbanded in 2014 due to low enrollment, returning management of the home to the city. In 2015 the city approved the sale of the home to professional golfer Gary Player’s company, Black Knight International; however, the sale did not close. The city then considered preserving the home for possible use as a museum. However, in January of 2017 an agreement was reached to sell the home for $600,000. The new owners will use the house as a private residence. (Greenville Woman’s Club) The Fountain Fox Beattie House, built by Fountain Fox Beattie ca. 1834, is significant for its architecture. This large Italianate dwelling was originally a much smaller, rather plain residence. It was the center of social, cultural, and religious life of early Greenville. The house was occupied by Beattie descendents until 1940. Now used as the Greenville Woman’s Club, it is the third oldest structure remaining in Greenville. A specific date for the home’s appearance is uncertain, although the style is that of the Italianate or Tuscan villa mode popularized by Alexander Jackson Davis prior to the Civil War. Davis’s designs were widely published and perhaps provided the inspiration for the Italianate detail on the structure. The two-storied central portion of the house has one-story flanking wings to either side. The one-story central piazza is supported by six pairs of square columns with one pilaster at each return. The freestanding columns are arranged to form three major and two minor semi-circular arches across the front with a major arch to either outer end. The balustraded piazza has a denticulated cornice with modillions and paired consoles corresponding to the columns below.